Generating quality content of adoptable animals is one of the most important aspects in getting them adopted and fostered more quickly, allowing rescuers to save more lives! On June 16th, representatives from seventeen NYC-area animal welfare organizations attended our unique workshop with HeARTs Speak. HeARTs Speak is a nonprofit organization that helps animal welfare efforts around the country, "uniting art and advocacy to increase the visibility of shelter animals." Recently, HeARTs Speak received support from The Petco Foundation Innovation Showdown for their incredible app Petblicity which provides marketing tools and materials to shelters at the touch of a button. For Foster Dogs Inc, as an organization that highly values positive marketing and quality content, we are thrilled to collaborate with HeARTs Speak and share their materials and wisdom with even more people! When we won the opportunity to receive the Perfect Exposure Project workshop, we immediately knew it was too valuable not to share with the rescue community - for free. This special event was a truly incredible experience. We're building a foster community, one workshop at a time! 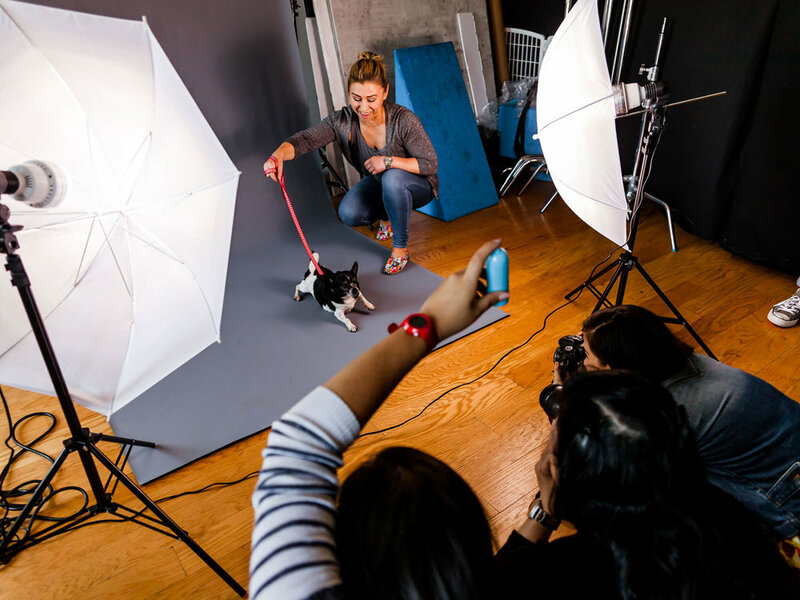 Held at BARK in Manhattan, rescue directors and volunteers spent their Saturday learning about photography and marketing from two nationally-experienced workshop leaders Caitlin and Valerie, of HeARTs Speak. Look for a large light source like natural sunlight because it'll be softer. Though try to avoid direct harsh sunlight; a shady area on a sunny day or a slightly overcast day is ideal! Light coming from directly overhead or under a subject isn't desirable. The ideal angle is 45 degrees over the photographer's shoulder. Light source should be in front of the subject; if the subject is back-lit, you may not see his or her details. If you have to shoot indoors, try to shoot next to (rather than in front of) a window or other larger light source. Try to avoid flash if at all possible, as it often ends up giving pets "demon eyes." It's great to show people in pet photos; it can help people understand a dog's size better, and shows off a dog's sweetness and willingness to interact with people. Pay attention to the background; get creative! Shooting sideways with a wall going off into the background may be more interesting than shooting straight ahead at the wall. Use the animal's eyes as the focus-point when snapping your photo. When writing an adoptable dog's bio, use the opportunity to tell a story and inspire a good match for the dog. Use everyday language (not industry-specific words) and be positive. Don't use the bio to do "heavy lifting" of talking through all the details or focus solely on restrictions (those can come later through discussion one-on-one). Among the organizations in attendance were: Animal Care Centers of NYC, Badass Brooklyn Animal Rescue, Friends With Four Paws, Fur Friends In Need, Louie's Legacy, Maddie’s Fund, Muddy Paws Rescue, Peaceable Kingdom, PupStarz Rescue, Ruff House Rescue, The Sato Project, Posh Pets Rescue, Twenty Paws Rescue, and more. We were joined by several four-legged models, including: Jimmy (PupStarz), Penny (Animal Haven), and Bobby Flay (Friends with Four Paws), Brinkley (adopted), and Sebastian (Foster Dogs' Fospice program). Brinkley the Poodle became a "foster fail" two years ago through Foster Dogs, and showed off his modeling skills at our workshop. Sebastian Stan, our newest Fospice friend, was one of the stars of the show. At twelve years old, he's ready for retirement. We are so grateful to BARK and their charitable branch Bark For Good for hosting, and allowing us to use an entire floor of their office space in NYC! This entire event was possible because of our volunteer Stacey Axelrod, who entered a national contest to bring the Perfect Exposure Project to a shelter around the country. Rather than keeping this as something available exclusively to our organization, we decided to share with the local rescue community! We'd like to say a big Thank You to Savage Universal for donating a studio set-up so that many of our fosters can now utilize the proper tools to create amazing pictures. Now let’s get out there and save more lives through quality photos and marketing efforts! View HeARTs Speak's EDU website for free downloadable tools and tips! Older PostAsk the Fosters: Should I adopt my foster dog?